Data and products associated with California State Coastal Conservancy project 13-118, "Regional Managed Aquifer Recharge And Runoff Analysis In Santa Cruz County, California"
Distributed Stormwater Collection and Managed Aquifer Recharge (DSC-MAR) is a landscape management strategy that can help to reduce aquifer overdraft and maintain long-term water supply reliability. DSC-MAR targets relatively small drainage areas (generally 100-1000 acres) from which stormwater runoff can be collected to infiltrate 100-300 acre-feet of water per year. Infiltration can be accomplished in surface basins, typically having an area of 1-5 acres, or potentially through flooding of agricultural fields or flood plains, use of drywells, or other strategies. Smaller projects might provide additional benefit, but unit costs are likely to be somewhat greater. Larger projects may require more infrastructure and/or maintenance costs. In 2014, the RCDSCC partnered with UCSC’s Hydrogeology Group, securing support from the California State Coastal Conservancy, to complete a Regional Managed Aquifer Recharge (MAR) and Runoff Analysis for Santa Cruz and Northern Monterey Counties, and to develop information and decision support tools to optimize storm runoff collection and MAR project implementation. The focus of this project is to quantify, in a documented and self-consistent way, where there is the highest potential for both suitable hydrologic conditions and enough stormwater runoff to justify implementation of a field project. Results should be most immediately beneficial for the region for which analyses were completed, but this project can also serve as a template for other parts of the state, where a similar approach could be applied. On this page you can download publicly accessible products from this analysis, including: GIS datasets, maps, input data, data processing descriptions, and precipitation and runoff model outputs to: a) identify and prioritize suitable areas for groundwater recharge, and b) evaluate hydrologic response (runoff vs. infiltration) under different climate scenarios. Why do we need DSC-MAR? Climate change threatens California's coastal watersheds, bringing more frequent extreme precipitation events, and an associated increase in runoff and reduction in infiltration and groundwater recharge. Changes in land use and increased freshwater demand are placing increased pressure on limited groundwater supplies. California lacks adequate surface storage for collection of stormwater runoff, although there is abundant subsurface storage in many parts of the state. Over the last two decades California has increased its statewide water supply deficit, much of it as a result of groundwater overdraft. This is particularly critical on California's central coast, where ~85% of freshwater demand is met by groundwater. The central coast is also virtually off the grid in terms of large scale regional water transfers, relying almost entirely on local groundwater resources. In 2015 DWR designated multiple groundwater basins in California's central coast as being in a state of "critical aquifer." Groundwater overdraft can lead to numerous undesirable conditions including: seawater intrusion, land subsidence, permanent loss of aquifer storage, loss of stream and wetland flow, damage to riparian habitat, and degradation of water quality. Improving groundwater conditions yields long-term benefits to both water supply and quality, positively impacting aquifers and associated aquatic systems, habitats, species and economic activities that depend on them. Where are the best places to recharge groundwater? MAR Suitability Analysis: This part of the project examined a series of surface and subsurface data sets to identify locations that could most effectively recharge groundwater within the study area. MAR suitability was assessed using a geographical information system (GIS) framework for collection, creation, modification, classification and manipulation of existing and new spatial and temporal data sets, to help guide the placement of implementation projects. Of course, hydrologic suitability is only part of the story, but it is an important part, and can be used as a "screen" to assess where to put effort initially to achieve the greatest and most rapid benefit. Many other factors must be considered before implementing a project, including (but not limited to): available water supply, water quality, available land and associated land use, interest among landowners and tenants, availability of incentives and resources for both capital costs and operation/maintenance of MAR systems, ease of measurement to document benefits, governance and management responsibility, comparison to alternatives, and permitting. Where and how much storm runoff can be collected for groundwater recharge? Runoff and Precipitation Modeling: Stormwater runoff was analyzed based on past, current and potential future precipitation and land use conditions. Runoff distribution and collection potential for individual catchments within the study area were assessed using the Precipitation Runoff Modeling System (PRMS), a publically available watershed model developed by the U.S. Geological Survey. PRMS has been extensively tested and is a widely used and accepted tool for assessing the impacts of changes in climate and land use on hydrologic basin response. PRMS model inputs consist of numerous spatially distributed data sets, including some of the same datasets developed for MAR suitability analyses, along with historic precipitation data to model how much runoff can be expected at any given location under specific precipitation conditions, based on soil, topography and land cover/use characteristics. Project region: Although this study was originally developed to provide information mainly to Santa Cruz County, CA, the study region was extended so as to include the complete drainage area that generates stormwater (hillslope) runoff flowing into Santa Cruz County, and the region overlying the Pajaro Valley Groundwater Basin, part of which is located in southern Santa Cruz County, but also including northern Monterey County. 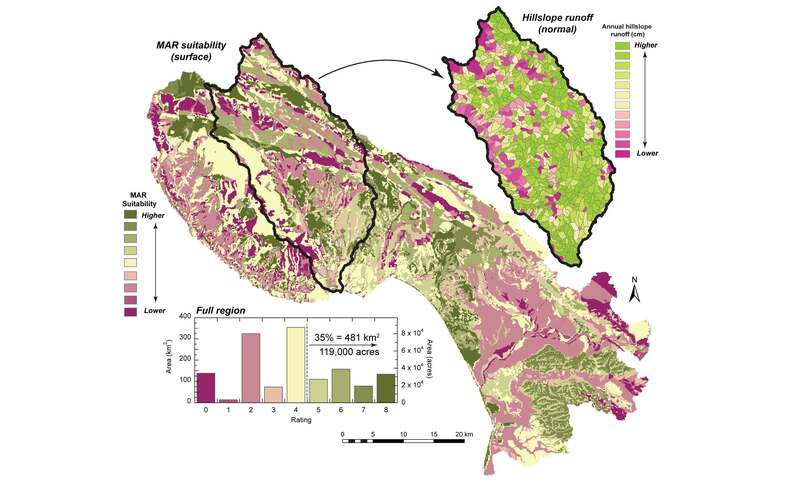 Hydrologic drainage regions included in this study were those delineated by the USDA for Santa Cruz County, comprising four subregional basins. The first set of data listed below (and available for download) includes GIS files that delineate the complete project region and the four drainage subregions.